Encouraged by the latest record of The People’s Republic of Europe, I decided to dig deeper in their discography, which brought me to their most famous album ‘Babylon’. And after I’ve listened to it for a few times, I’m now certain that ‘Machine District’ is not only a continuation, but also a confirmation of the band’s top shape. Basically, ‘Babylon’ is a mixture of Industrial and Power/Rhythm Noise with a few additional tweaks which complete the picture. The starting ‘Ubermensch’ is an ideal introduction to the somewhat grim atmosphere of the album. While listening I imagined burning furnaces, working day and night, spewing endless clouds of smoke. Next in line is a dynamic, ‘typical’ if I may say so, ‘Wolfpack’, which thanks to its rhythm is a great soundtrack for the assembly line work. 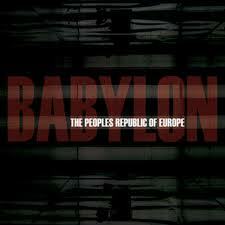 ‘New Babylon’ is an interesting one. I can feel a tribal spirit in this track, one which got accidentally entangled within a machine granting it new features. The effect is strengthened by a spacious-sounding beat and difficult to understand, but quite characteristic vocals/screams. However, ‘Dirty Distorted Dancehall’ is where things gets really exciting. Electro-like rhythm, industrial glitches and vocal samples are a great blend indeed. My eyes opened even wider when I heard ‘Wardance’, which features drum’n’bass pace with a slight sway towards jungle/techno. This must be a killer tune to play live. So far so good, but my favourite on ‘Babylon’ is track no.8 – ‘To Prove a Point’. Once again TPROE explores the D’n’B area, however they manage to keep their character thanks to many different industrial elements and quite dark backgrounds. ‘Nicolae Carpatia Died For Your Sins’ is a slower one, but includes capital keyboard work in the background, and the last tune on the disc, ‘Bow for Xenu’ is a bit weaker than the rest of the album due to a simple fact of nothing interesting going on in it. All that is left to say is that although a good album, ‘Machine District’ is not a one-shot revelation. Before came the ‘Babylon’, which for some might even be better than ‘MD’. Whatever the opinion, I recommend this LP to everyone who appreciate a fresh look on Industrial/Power Noise music. Satisfaction guaranteed.